Chester Castle will be opening again during the summer. Last year’s enthusiastic volunteers had a huge impact on the success on the Castle opening and now there is an opportunity to take part in ‘Views from the Castle’. The Castle will open Friday, Saturday and Sunday’s, from 20 July to 16 September. Visitors will be able to wander around and experience the historic site free of charge. Access will be available to the ground floor of the 12th century Agricola Tower which will house a pop up exhibition telling the fascinating story of the Castle which can be traced back to 907 AD. 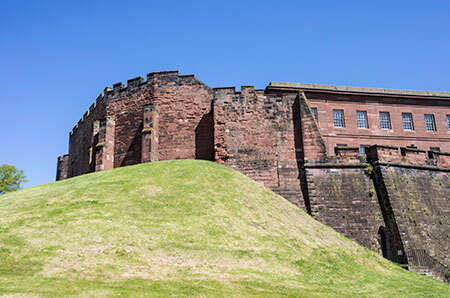 The Castle and tower will also open on Wednesday 27 and Thursday 28 June as a part of the Chester Heritage Festival. Pre booking will be necessary for these two days. Councillor Louise Gittins, Cabinet Member Communities and Wellbeing said: “We had a truly dedicated group of history lovers volunteering last year and I’m sure this year will be no different. Volunteers make a huge contribution to the visitor experience across all our museum sites in West Cheshire and we really appreciate their hard work and dedication. Once again visitors will be able to look around this historic site that opened last year for the first time in many years. All volunteers will be provided with a full induction, if you have an interest and enthusiasm in heritage and history, have good communication skills and enjoy bringing history to life for visitors this would be an ideal volunteering opportunity for you.